Marcus Wareing is a chef with a lot on his plate. The Michelin-starred proprietor of London’s Marcus in the Berkeley has just opened his third restaurant, this time located in Seven Dials, Covent Garden. 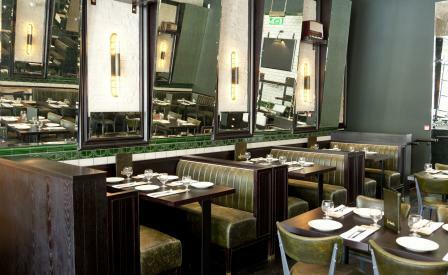 Named Tredwell’s, after the butler in Agatha Chrstie’s novel The Seven Dials Mystery, the three-storey eatery was conceived by local firm Robert Angell Design and features an eclectic dining space with green leather banquet seating and atmospheric tinted mirrors. Heading up the kitchen is chef Andrew Ward, whose relaxed and informal sharing menu features modern European dishes such as harissa glazed aubergine with peanuts, coriander and chilli and smoked beef shortrib with baked beans.